Project-based English Program (PEP) is an English program which was first suggested and put into practice in 1990 with Dr. Yuji Suzuki leading the initiative at Keio University Shonan Fujisawa Campus (SFC). In the SFC program, all lessons were suggested to be run in a project-oriented manner, making use of the state-of-the-art ICT (Information Communication Technology) of the time. Dr. Suzuki initiated a project-based approach not only in his classes for the students in the freshman and the sophomore years; Project English and Language and Communication, but also such subjects in specialized fields as Modular English, English Diversity, English in Social Context, Language Communication Theory, and Context and Semantics. The students in those classes focused their research on what they were personally interested in, and they were able to express their findings in a global context, using English for English subjects and Japanese for other subjects. The details of Suzuki’s project-based classes can be found in his book (eigo kyouiku no gurando dezain; “Grand Design of English Education: Practice and Prospects of Keio University SFC; Yuji Suzuki, published by Keio University Press, 2003). In 2000, at the request of the president of Chiba University of Commerce, Mr. Hiroshi Kato (the creator of SFC, and the first dean of the SFC Faculty of Policy Management), and under the direction of the first dean of the newly created Policy Information department at the same university, Mr. Toshiaki Izeki (also the second dean of the SFC General Policy department), Dr.Suzuki introduced a project-based English program as an English advisor, achieving reasonable results. Soon after, Dr. Suzuki was paid a visit in 2007 by Mr. Yoshihiro Taniguchi who was a member of the committee for the launch of Ritsumeikan University College of Life Sciences and College of Pharmaceutical Sciences (also the first dean of the same colleges), which were established in 2008. Dr. Suzuki explained the PEP program to him, and it was agreed that the program would be officially introduced to these colleges. From November of 2007, as a visiting professor at Ritsumeikan University, Dr. Suzuki improved his project-oriented program for this university. Upon taking early retirement in March 2008, he took up a position in the College of Life Sciences and the College of Pharmaceutical Sciences of Ritsumeikan University in April of the same year. Following this, in November 2007, the latest version of the PEP program was introduced at the request of Prof. Kei Kanayama, who was responsible for the GP program of Ritsumeikan University Graduate School of Science and Engineering. Even though it was only for a short period, the PEP program was introduced in the GP program, and it achieved certain results towards its goal of raising graduate students of technology with a sense of international cooperation. Further, the program was improved through a thorough review of relevant issues in the program. In 2010, the program was introduced to College of Sport and Health Science, established in that year. In 2016, it was also introduced to College of Comprehensive Psychology established in that year, and it is continuing now. In SFC, Dr. Suzuki took the lead in this program with him teaching his classes. However, as the program was run in a small part of overall English courses, it was not made available to all the students of College of Policy Science and the Department of Environment Information (approximately 450 in each year). After much reflection over this issue, it was made possible for all students in both the newly created the colleges (about 420 students in each year) to study in the program. We keep up close communication between all English teachers, faculty members of all undergraduate departments, undergraduate executive departments and administrative offices. In specialized English programs, the science teachers and the English teachers can collaborate, and this has drawn high praise from outside the faculty. In this way, the outcomes of the PEP program reach a high level. 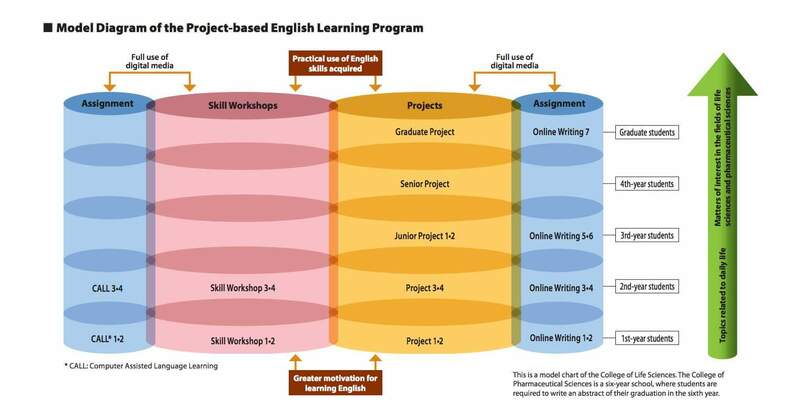 As shown in the diagram below, the projects and the skills workshops have an organic interaction which results in higher quality project results and higher scores in English proficiency tests, such as TOEIC. The projects at all levels are mainly the responsibility of full-time faculty members and “shoutaku” full-time English language instructors. They keep up close exchange of opinions with the staff regarding the classes, focusing on communication and collaboration among the staff. The teaching materials and the PEP methodology were developed by Dr. Suzuki and the other. teachers in this program. In order to nurture sufficient English ability of the students, Skill Workshops are carried out through intensive drills in an interactive way with English native teachers. This Skill Workshops are carried out by the external education institutions specializing in this area. The English teachers and the representative from the external institution discuss and collaboratively come up with fresh materials and methodologies. For students who lack the basic English skills that are necessary to do well in this program (students entering from affiliated or designated schools etc. ), we have developed an online program “Brush Up English” where their basic English skills can be improved. For more details about this program, please refer to the publication by Yuji Suzuki (2003) entitled, “English Lessons for Living in a Global Society”: the PEP Project English Program of Ritsumeikan University for College of Life Sciences, College of Pharmaceutical Sciences, the Graduate School of Life Sciences. Research regarding the language communication theories which this program is founded on is also being actively conducted. Using the insights from the practical activities used in this program, basic research has been conducted, carried out in a very organic, symbiotic relationship with practice. In other words, the philosophy of “research is education, education is research” runs through the program.